The following is a list of classes that were offered by the guild during the 2014-2015 guild year. During this class you will get an overview of weaving by walking through all the steps of weaving from yarn calculations to weaving a small sampler. Find out if weaving is your thing in this afternoon long workshop. Sunday, Oct. 12 at the Carrboro ArtsCenter. Contact the Carrboro ArtsCenter to enroll. Add unique color to your weaving projects with warp painting. Blend and overlap colors to create your one of a kind palette on scarves, linens or yardage. Learn to use fiber reactive dyes. Experiment with color. This one-day workshop will include a brief discussion of color theory, dye safety and color mixing, considerations for dyeing scarves or other projects, and finally warp painting. 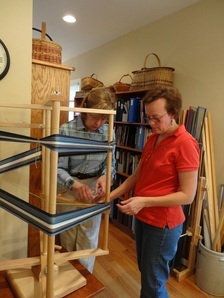 Bring two prepared warps (cotton, linen, tencel, bamboo, or silk) and willingness to experiment. Details about preparing warps will be provided after registration. Beginners and Intermediate students are welcome. Intermediate students who have attended a previous dye workshop will be allowed to skip the lecture portion of the workshop and begin dyeing their warps earlier. ** All participants should plan to attend the September Guild Meeting to learn how to prepare the warps for this workshop. Class Details: Full instructions are provided once you register & pay. Other: Bring your own lunch. Objective: Learn weaving terminology, plan a weaving project, prepare a warp, warp the loom, weave and finish a project using basic techniques. The weaving project for this class will be mug rugs, placemats or a table runner. The 2015 Spring Workshop features fiber artist and handweaver Daryl Lancaster and is a 2-day event. A crash course in garment construction, embellishment, piecing, fit, finishing, and all around fun! For weavers or anyone interested in learning to construct great looking and great fitting garments. Learn to be creative with your seam finishes, buttonholes, closures, linings, and embellishment. This is a terrific class for those wanting to learn to sew clothing from their hand-woven or other special fabric, as well as for those more experienced wanting polished and professional results. Bring a sewing machine and try many of the techniques. Daryl has over 45 years of experience sewing handwoven garments and is a frequent contributor to "HANDWOVEN" Magazine. She lectures and conducts workshops for guilds and conferences throughout the United States. 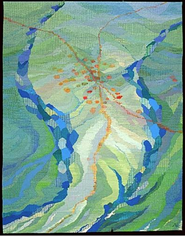 We are excited to announce a daytime tapestry class with Anita Wolfenden to be held at our Triangle Fiber Arts Center at Murphy School. The class will be three Wednesdays, starting mid to late April, going into May, spaced several weeks apart to allow plenty of time to weave and to accommodate Anita’s schedule. In between classes Anita will be available via e-mail to answer questions. Though this is a beginner’s tapestry class, it is for members that are comfortable weaving and comfortable with weaving terminology, so the time can be spent specifically in tapestry techniques. In other words for advanced beginners and beyond. Maximum number of students is eight. 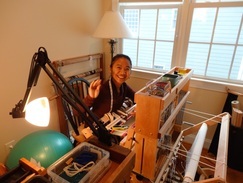 Material & Equipment; Students can use portable frame looms that Anita has donated, or their own portable looms. Students may want to work on a frame loom in class and then work on a floor loom on a bigger piece at home. Anita has also donated a large selection of materials which will be available for use during the class. Class size is limited to 8 students. Since we anticipate a lot of interest, if there are more than eight, we will have a lottery.